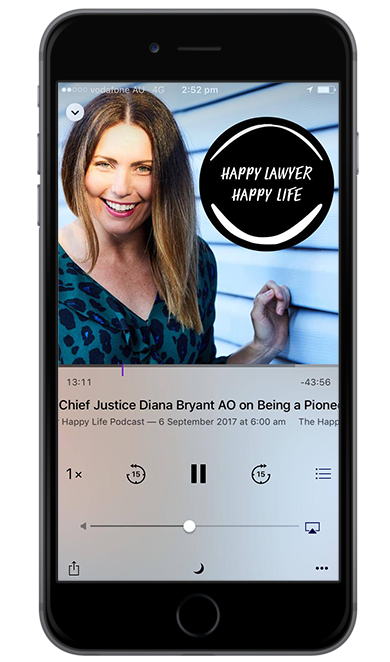 In this week’s episode of the ‘Happy Lawyer Happy Life Podcast’ I had the pleasure of interviewing my good friend of 20 years, Myra Kochardy. Now this took some persuading but I got there in the end and Myra and I sat down early on Sunday morning for this chat. Having grown up in Switzerland with two professional classical musicians as parents and another budding (now professional) musician sister, I certainly expected Myra would find her professional feet in the world of music but instead law has been her thing. And interestingly, I think even Myra is still surprised that she has found happiness in law land. Myra’s career in law began almost by accident. After having migrated to Australia at 18, it was a chance meeting with a neighbour that happened to be a Supreme Court Judge that inspired Myra’s decision to study law. But like so many of us, she began her degree and then ‘left’ for a while before coming back and finding her feet with a new sense of purpose after having volunteered in the south of China. Myra has since gone on to build a niche in Health Law- initially in private practice and now as an advisor in Government. I am so grateful to have captured Myra in this chat. She really does embody happiness for me and is someone who I have always enjoyed hanging out with as she really does make everything an adventure! She is one of the most kind, generous people I have ever met and so today she is the perfect guest to celebrate International Happiness Day for 2019! If Myra was not a lawyer she would have been a ‘chain smoking’ tango dancer (ha!) or a teacher. Myra and I have known each other over 20 years having met in a hip hop lesson and then ending up at uni together. Myra was born in Switzerland and moved to Australia when she was 18 years old, during her final year of school. Myra’s experience of going to school in Switzerland and the differences between there and Australia. After this experience Myra decided to pursue law, however, after 9 months Myra switched her focus to International Relations. Myra took a break from uni- she wanted to travel and landed in South-East China to teach English with ‘Volunteers International’. It was this experience overseas in China, that enabled Myra to re-consider the study of law and on her return she headed back to Uni to get that degree. The rest is sort of history- she fell into a role at the Brisbane firm, Roberts & Kane a wonderful small firm where she was mentored and inspired and found her niche in Health Law. During this time Myra also started to lecture in Health Law and Ethics and loved the balance of teaching and practicing law. Fast forward a few years, Myra meets her wonderful husband Matayas, they get married and before you know it they are both of to Canberra. Creativity is a huge part of Myra’s life and she manages to bring this element into her legal work. Myra has lived in Canberra for 8 years and it reminds her of her home town in Switzerland. The cultural access that Myra has in Canberra and being able to share this experience with her colleagues outside of the law. Myra works in Policy and Advisory Law and she explains what this means in her daily law life. Finding a role in Government (including graduate positions) and Myra’s experience of working in this environment. Myra is a super content human being and has a beautiful outlook on life and puts on her ‘different’ hats to be able to cope with the daily balances of life. Boundaries and health are huge parts of Myra’s life and she shares why this is so important to her. Managing the mental load of life and managing expectations both in and outside of law land. Myra’s tip for other lawyers; to follow the people, not the work. Sit back and enjoy this interview with Myra Kochardy.